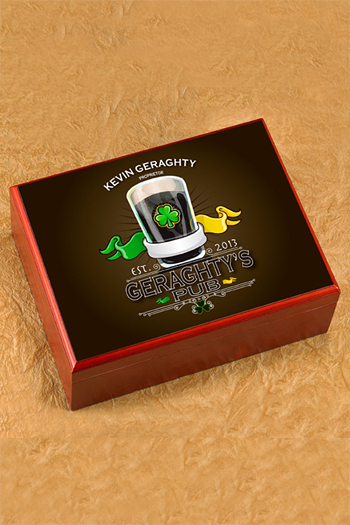 Accent your home bar with this Irish themed rosewood sublimated cigar humidor featuring a Irish pub design and cherry finish. 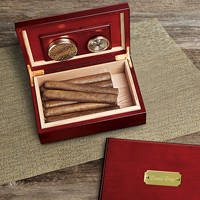 Humidor measures 9 1/4" x 7 1/4" x 3 3/4" and will hold up to 12 cigars. When properly monitored, cigars will be as fresh as the day they were bought. 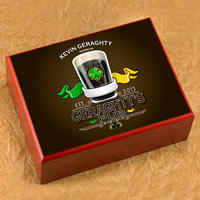 This humidor showcases a Guiness draught beer and a lucky green shamrock along with the name of the owner and year. Size: 9 1/4" x 7 1/4" x 3 3/4"